Why should you use a shaded lamp? Our shaded fabric lamps add to the dining experience just like artwork and other décor. But lamps have the benefit of being much more noticeable as they sit on the table and attract the eye of the restaurant patron. Our shaded lamps also have the advantage of softening the light. Instead of having a glaring candle interfering with a good conversation or meal, there is a soft romantic light that plays over the entire table, adding to the ambiance of the dining experience. More practically the shaded lamps provide a double protection for the flame. First, the flame is completely encased in glass and then placed on a stable base and covered with our lovely shades to ensure the flame is safe. They are made of heavy gauge wire which is sturdy enough for the rigors of commercial use. The frames are powder coated to inhibit rust. The shades are hand-sewn of flame-retardant fabrics and trims that meet commercial flame retardancy standards. (NFPA701). See all our many styles and shapes below! #1 Drum Fabric Shade (3.25” x 6” x 4.5”H) Our drum shades are a timeless, classic, and very popular shape because they go with many décor styles. They can be made for a C (candle),LF (larger fuel) or E (electric) lamp. Has 4 side wire "ribs”. 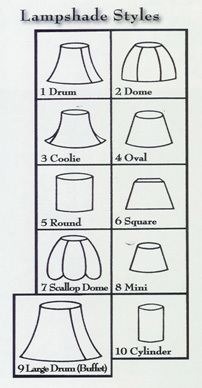 #2 Dome Fabric Shades (3.25” top x 6” bottom x 4.5” H). Slightly shorter than the drum shade, this shape flares out a little more, giving it a slightly more contemporary style. Will fit C or LF lamp. This shape is nice when used with an oval lamp base. Avail. For C or LF lamps. An elegant, contemporary style that fits over our "C” pegged votive glass. #6 Square Fabric Shades: This shape has a square top and bottom, and is slightly flared, offering a bold, contemporary style. Available for C or LF lamps. An elegant, almost Victorian style remains a favorite for a traditional look. The wire framing is not easy to do, but our wire jigs maintain uniformity. Available in C or LF version. The same quality workmanship that is in our larger shades is also available in a smaller version on our mini candle lamps. #9 Large Drum Buffet Shades: 4” top x 9” bottom x 7.25” H. This larger shade fits on our tall buffet lamps which are 25” H. Available in C, LF or E version. The slender shape of this NEWEST shade is sleek and contemporary, and is also space-saving. Available for LF lamps only.